(Newser) – After recounts, Florida has a new governor and a new senator—and Broward County is going to get a new elections supervisor. 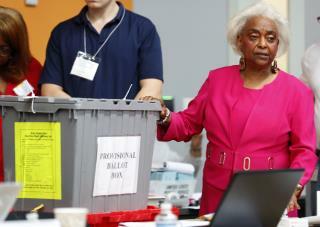 Broward Supervisor of Elections Brenda Snipes handed in her resignation Sunday, hours after a manual recount finished and Democrat Bill Nelson conceded the Senate election to Gov. Rick Scott, the Sun Sentinel reports. Snipes, 75, was attacked as corrupt and incompetent by Scott, President Trump, and other prominent Republicans during the recount process. Her resignation comes after two weeks in which her staff misplaced 2,000 ballots, mixed more than 20 invalid ballots in with 200 good ones, and missed a deadline to submit recount results, reports the Miami Herald. Just like in sports, when the team fails, the coach is always the first one to go. Snipes did not act alone. The corruption is found at every precinct. The people doing the counting and handling of the mail in votes is where the problem begins. The corrupt must be removed from the local precinct level and move on up to the head coach. The Dems have their operatives working at the lowest levels to cause the problems. Every one must go. For over 20 years they have been playing their games. The next leader must clean house beginning at the lowest levels. This racist little black woman strikes me as having her finger in all sorts of profitable pies . I think someone ought to look at her bank account /accounts and under her mattress and the floorboards floorboards and not forget that she probably has other addresses . And how many people who ran for office got into office because of miscounting or public corruption? They're just counting, how difficult can this be. Who's bribing who?